Definition at line 23 of file CEvaluationNodeNumber.h. Definition at line 29 of file CEvaluationNodeNumber.h. Definition at line 26 of file CEvaluationNodeNumber.cpp. Definition at line 30 of file CEvaluationNodeNumber.cpp. 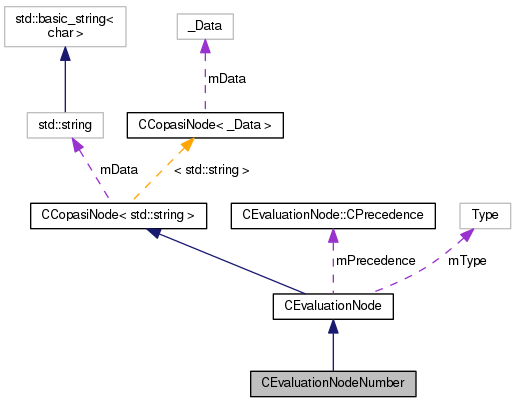 References DOUBLE, ENOTATION, fatalError, INTEGER, INVALID, CCopasiNode< std::string >::mData, CEvaluationNode::mPrecedence, CEvaluationNode::mValue, PRECEDENCE_NUMBER, RATIONALE, and strToDouble(). Definition at line 66 of file CEvaluationNodeNumber.cpp. 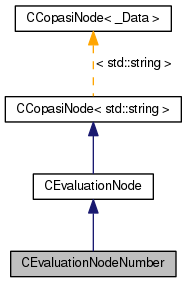 References CCopasiNode< std::string >::mData, CEvaluationNode::mPrecedence, and PRECEDENCE_NUMBER. Definition at line 79 of file CEvaluationNodeNumber.cpp. Definition at line 83 of file CEvaluationNodeNumber.cpp. Definition at line 86 of file CEvaluationNodeNumber.cpp. References CEvaluationNodeConstant::_INFINITY, CEvaluationNodeConstant::_NaN, abs, CCopasiNode< _Data >::addChild(), CEvaluationNodeNumber(), DOUBLE, ENOTATION, INTEGER, INVALID, CEvaluationNodeFunction::MINUS, RATIONALE, and CEvaluationNode::subType(). Definition at line 270 of file CEvaluationNodeNumber.cpp. Definition at line 258 of file CEvaluationNodeNumber.cpp. 264 //or use mValue instead? Create a new ASTNode corresponding to this NumberNode. Definition at line 211 of file CEvaluationNodeNumber.cpp. References DOUBLE, ENOTATION, CEvaluationNode::getType(), CEvaluationNode::getValue(), INTEGER, INVALID, CCopasiNode< std::string >::mData, RATIONALE, strToDouble(), and CEvaluationNode::subType().